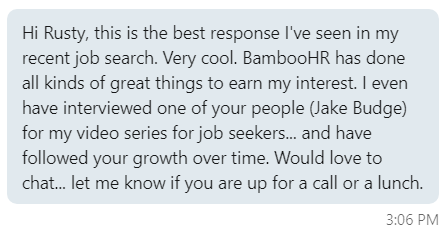 The first communication I had from anyone at BambooHR for this job was shocking. It was a personal LinkedIn message from the hiring manager that was not cold or off-putting, not impersonal or prescribed. It was also flattering, and showed that he had looked at my LinkedIn Profile and saw that I might be a perfect match. I was blown away. I was flattered. Maybe. Maybe he just had that personality, but I didn’t think so. The question he asked is why I was interested in that role? Me… the CEO of JibberJobber, someone who had pushed out 30 Pluralsight courses… why in the world would I be interested in that role? It took me a while to write that. I am a prolific writer, they say, and I wanted to write a novel. HIRE ME! PUT ME IN, COACH! Alas, a lot of writing and backspacing, and that is what I came up with. This was a bit nerve-wracking, because by this point I found the perfect role at the perfect company. I could make a difference in a company that was making a difference in the world. They had almost ten years of purpose and I would add value, based on my eclectic experience that others couldn’t understand. But Rusty understood. And he reached out to me and treated me with dignity. I don’t need my ego stroked, but every job seeker knows that being treated with dignity, as a human, is rare. If there’s anything you can take away from this (today’s post), it is this: Treat your communication as very special, and spend time writing and cleaning your messages. Make sure you know what you want to say, what you don’t need to say (and would only be a weird distraction), and send THE RIGHT message. But then, stop second guessing yourself and hit send.